There’s yarn kits for this pattern available via O-Wool. Is there a little girl in you, too? There’s definitely one in me. I know that pink is not the color I usually feel pretty in. It’s so loud, so emphasizing, like a huge exclamation mark. That’s not me. But then again, I’m sometimes very much drawn towards it. When I looked at the O-Wash palette, there were these two colorways that instantly caught my eye - a dark, brown-ish grey and that stunning pink pop of color. Note: All three skeins have almost completely been used up for the original sample. If you want to make sure you don’t run out of yarn, do a gauge swatch. Also, you can safely leave out 1 repeat of Section 2 for a smaller (but still genereously sized) version of the shawl. 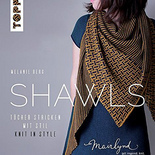 SHAWLS - My new book!